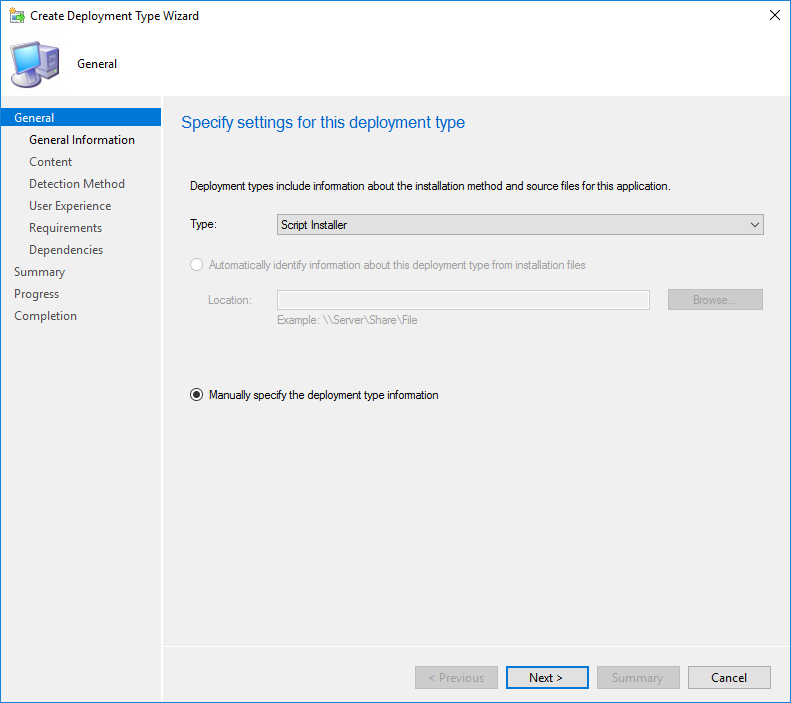 This blog post will describe how to Deploy Office 2019 using SCCM (using Click-to-run version). 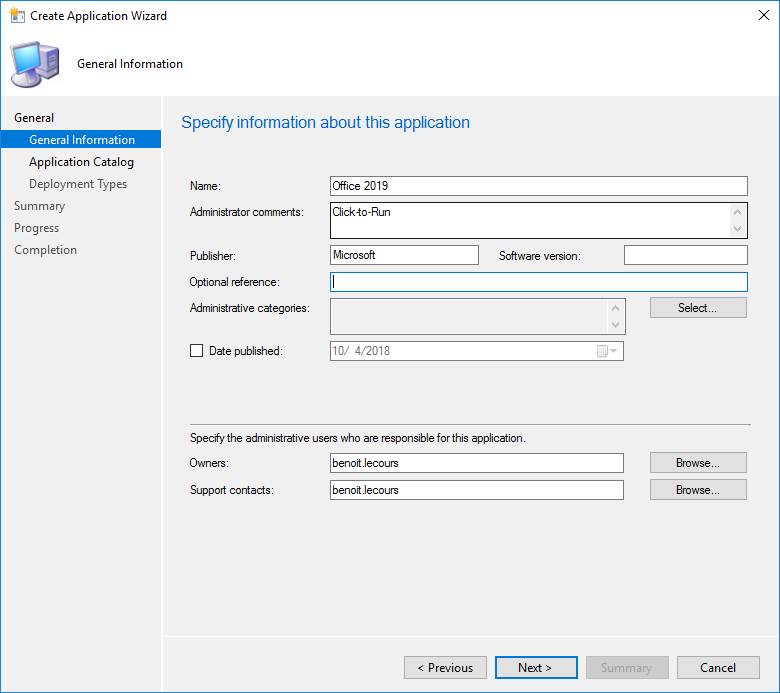 Beginning in Office 2019, Office client applications will no longer be available in MSI format. 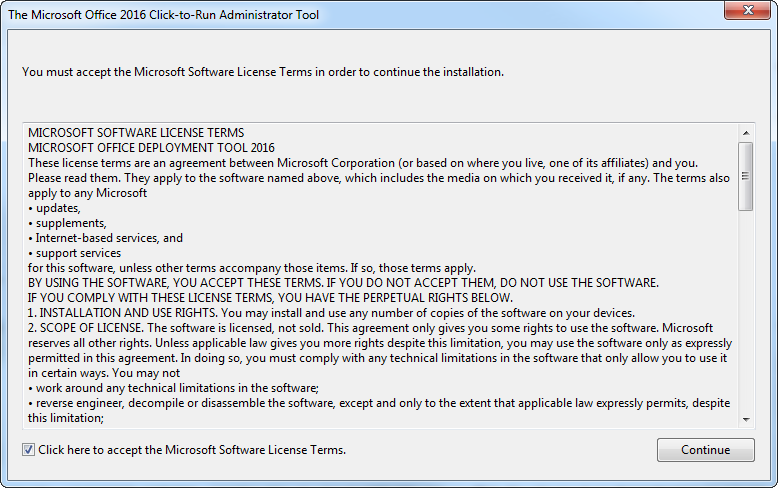 You can download an ISO on your volume licensing download center or use the Office Deployment Tool. We suggest using the Office deployment tool to have the latest available version. Office 365 is a subscription that comes with premium apps like Word, Excel, PowerPoint, OneNote, Outlook, Publisher, and Access (Publisher and Access available on PC only). The apps can be installed on multiple devices, including PCs, Macs, iPads, iPhones, Android tablets, and Android phones. With a subscription, you get the latest versions of the apps and automatically receive updates when they happen. The first step is to download the Office Deployment Tool and create a Download.xml file that we’ll use to download the latest version of Office 365 Pro Plus (2019). Read the Reference for Click-to-Run xml file to know more about the available options. This is not a mistake. The Office Deployment Tools is version 2016. If you read the fine print you’ll see that the ODT can download 2019 products: Updated to support the download and installation of Office 2019 products. It’s important that you don’t include the SourcePath attribute in the Add section of your Configuration.xml file. That’s because SCCM copies the installation files for an application into a folder under the SCCM client cache folder, and the name of that subfolder is different for each computer. The DisplayLevel and AcceptEULA parameters ensure that our installation is silent. You can also use the PIDKEY setting if you don’t have a KMS server for activation. 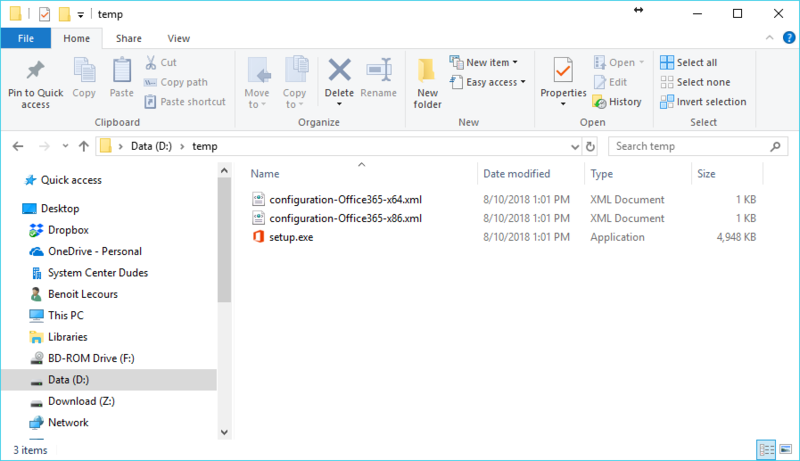 The download starts silently, you’ll see an Office folder appear in your specified Office 2019 directory (in download.xml). The folder is around 2GB so it will take some time to complete depending on your download speed. You won’t have a notification when it completes. 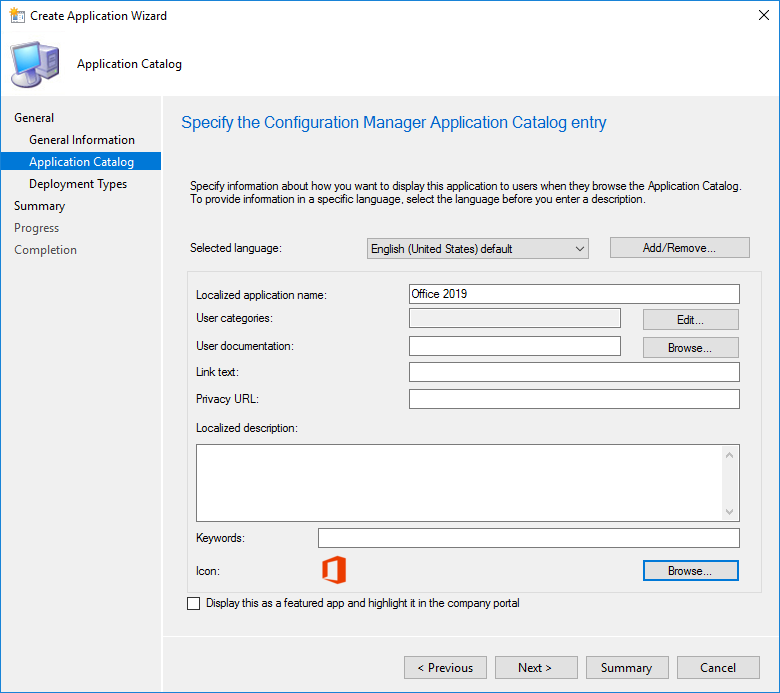 If the directory was created outside your SCCM source directory, move it to its definitive location before creating the application. 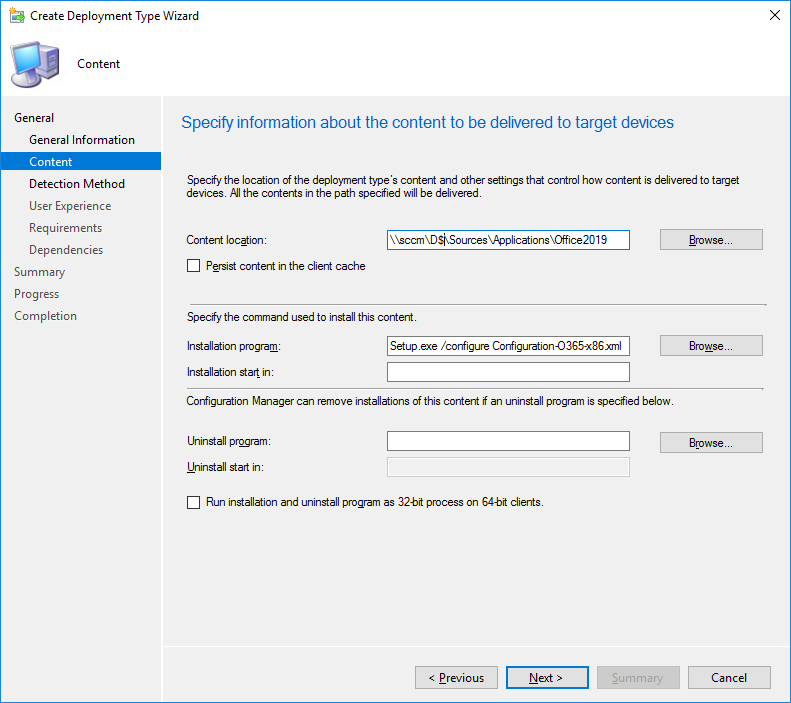 The only step left is to distribute the content to your distribution points and create an SCCM Office 2019 deployment. There is a new set of Administrative Template files (ADMX/ADML) for Group Policy settings. 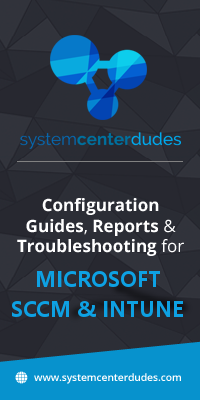 You can download the Administrative Template files using this Microsoft Download Center link. this didn’t work. 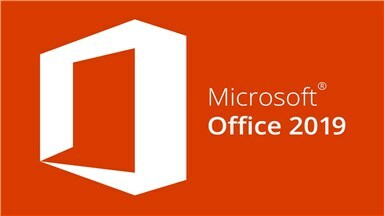 the office 2019 splash screen comes up for a couple seconds and then disappears, office 2019 is still installed. absolutely nothing else we require :D.
Ok I just tried to deploy the x64 bit version and it failed with the error code: 0x87D00324(-2016410844). The programs was not detected following installation. The software didn’t install at all. I was trying to do both Office and Vision. All and any comments would be greatly appreciated. sometimes handwriting a xml config will cause errors you can use this https://config.office.com/ to configure the xml for you. As of novembre 22 2018, Office 2019 is not present in SCCM ODT (through office 365) and client update are into Office 365 client items, not with regular Windows Update. Also, they aren’T categorize as Office 2019, they are categorize as Office 365. But, for me, when I installed Office 2019, I have put the item ” ” and not, even if SCCM tell me I have a computer which require the update, it doesn’t appear in SCCM Client and the Office 2019 isn’t updated. What is the suggested process to remove Office 2016 (installed via MSI) before installing Office 2019? We created the Office 2016 Application in SCCM (IIRC we used a guide from here); then deployed this during our PXE process. Now we need to uninstall this MSI version first before pushing the new click-to-run 2019 version. I have followed all these steps. Client downloads and when indicator flips to “Begin installation” it immediately fails. Suggestions on which log file to look at to determine why i fails? Have you uninstalled the previous version of Office? Mine was doing the same thing and manually removing or not have any Office apps open fixed it. David James from the ConfigMgr team confirmed that Office 2019 support will be included in ConfigMgr 1810. Anyone know how to configure the uninstall? I was able to successfully download the Office 2019 files but whenever I run the installation using the configuration file, It runs for about 10 seconds then exits without doing anything. Any clues? Short hint: After pasting the mentioned content of the download.xml into Notepad++ I got an XML Parsing Error and “30088-1007”-Error in ODT. After searching a while I noticed that the mentioned quotes in your download.xml are “italic-quotes” and not the “standard-XML-quotes”. After replacing them the download worked like a charm. 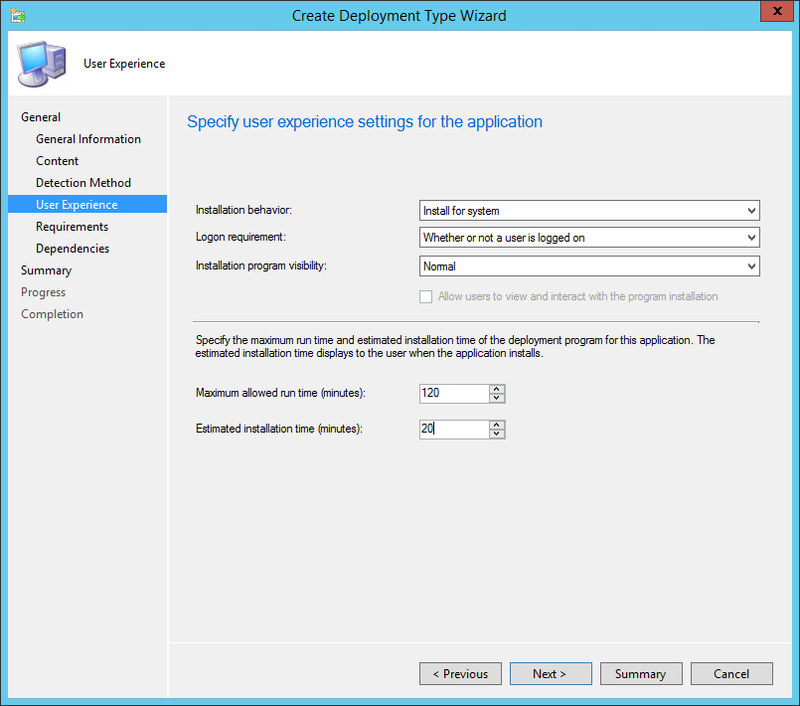 This provides the steps of deploying this without using that Office 365 wizard. Thank you! We’ve been deploying 32-bit Office, but with this release we’ll be moving to 64-bit. Once it’s deployed, I’d love to see a follow-up article around keeping these installations up to date. This detection method is not is not recommended if you plan to deploy Visio and/or project 2019. 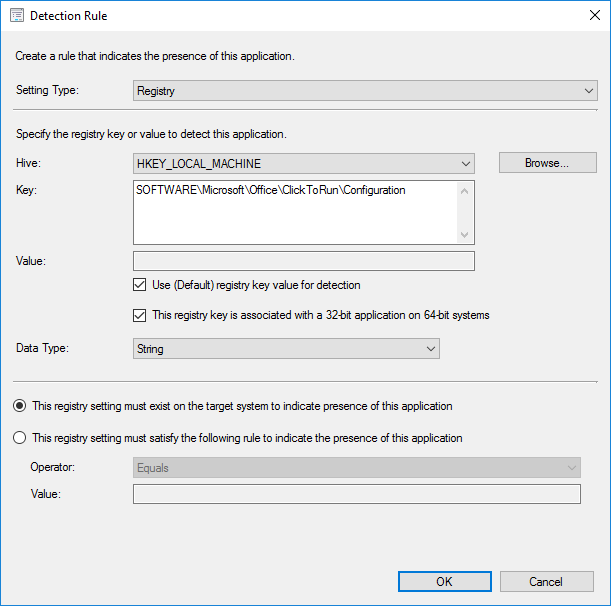 Better of using the registry key in “HKEY_LOCAL_MACHINE\SOFTWARE\Microsoft\Windows\CurrentVersion\Uninstall” and use the subkey for each product.